This list provides an overview of books on the theory and practice of orchestration and choosing the right instrumentation. Principles of Orchestration. Nikolay Rimsky-Korsakov. Dover Publications, Inc. 1950. ISBN 0486212661 (paperback). Addressing the emotional and psychological effects of instrumentation, as well as techniques in orchestration, this is a classic text by one of the great orchestrators. Treatise on Instrumentation. Hector Berlioz, Richard Strauss (foreward). Dover Publications, Inc. 1991. ISBN 0486269035 (paperback). One of the most influential works of its kind, appraising the musical qualities and potential of over 60 commonly-used stringed, wind and percussion instruments. With 150 illustrative full-score musical examples from works by Berlioz, Mozart, Beethoven, Gluck, Weber, Wagner and others, and numerous smaller musical examples. Complete with Berlioz' chapters on the orchestra and on conducting. Translated by Theodore Front. Foreword by Richard Strauss. Glossary. Thesaurus of Orchestral Devices. Gardner Read. Greenwood Press. 1969. ISBN 0837118840 (hardcover). In english, Italian, French, and German with instrument complete ranges, best ranges, characteristics of ranges, list of effects and devices with references to page number and measures of compositions quoted. Orchestration. Cecil Forsyth. Dover Publications, Inc. 1983. ISBN 0486243834 (paperback). One of the classic general orchestration texts. Thorough discussion of 57 instruments, technical aspects of writing for each. Though this text is somewhat dated (1913 copyright), it does provide a worthwhile introduction to the topic. Each instrument of the orchestra is covered in detail, and the section on writing for strings is outstanding. Uses musical examples, and is appropriate for readers with a moderate knowledge of theory who are interested in the technical side of orchestration. 576 pgs. The Technique of Orchestration. Kent Kennan, Donald Grantham (contributor). Prentice-Hall. 1996. ISBN 0130771619 (hardcover). Designed primarily as a text for beginning orchestration courses, but includes material for advanced study and may serve as a reference. 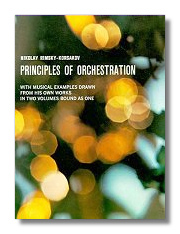 As in the earlier editions, the emphasis is on the practical fundamentals of orchestration. The Sixth Edition has been expanded and revised to reflect new developments in instruments and orchestral practice, and a new listening compact disc has been added that contains selected examples of orchestration. Read the Classical Net Review of this book. Counterpoint. Kent Kennan. Prentice-Hall. 1998. ISBN 013080746X (hardcover). Designed for courses in Music, this established text introduces the contrapuntal style of 17th and 18th century music through analysis and writing. While a limited understanding of contrapuntal elements may be gained through analysis alone, these elements are grasped in a more intimate way through the actual writing of contrapuntal examples. Also, by linking the study of counterpoint to music of a specific period, the text provides a clear model for students to emulate and a definite basis for the criticism of student work. Writing for the Orchestra: An Introduction to Orchestration. Merton Shatzkin. Prentice-Hall. 1993. ISBN 0139534318 (hardcover). This reference details the basics as well as the refinements of writing for the symphony orchestra, the band, and string orchestra. Focuses on the difficulties of performance of an instrument, the things to avoid when writing for instruments, how to accomplish basic necessities, guidelines for scoring, preparing the score and parts, and unusual uses of instruments. Ideal for introductory and intermediate courses in Orchestration. Coherence, Counterpoint, Instrumentation, Instruction in Form (Zusammenhang, Kontrapunkt, Instrumentation, Formenlehre), Arnold Schoenberg. University of Nebraska Press. 1994. ISBN 0803242301 (hardcover). Only Stravinsky can claim as much credit as Schoenberg for the most dramatic innovations in twentieth-century music. Inventor of the twelve-tone row, explorer of atonality and the hexachord, composer of tone poems, songs, and chamber music, and chief spokesman for the Vienna Circle, Schoenberg has become ever more influential as his successors have come to understand him. Fuller understanding has been delayed because many of his writings have not yet been edited or published. This volume collects four short works, each concentrated on a key issue in composition. Written in 1917, but altered and augmented many times in later years, the manuscripts edited and translated in this volume have never been published before. These important documents present Schoenberg's thinking well after the publication of Theory of Harmony (Harmonielehre) in 1911, his revolutionary theoretical book. The later texts provide numerous prospects for enhancing the study and appreciation of Schoenberg's compositions and theories. Also a painter, Schoenberg enjoyed the friendship of Kandinsky and the Berlin expressionists. This volume includes a frontispiece reproducing one of Schoenberg's paintings. Orchestration and Orchestral Style of Major Symphonic Works: Analytical Perspectives. Leonard Ott. Edwin Mellen Press. 1997. ISBN 0773486011 (hardcover). Works by Haydn, Mozart, Beethoven, Mendelssohn, Berlioz, Tchaikovsky, Rimsky-Korsakoff, Mahler, Strauss, Debussy, Ravel, Stravinsky, Schoenberg and Webern are analyzed symphonically. Orchestration. Walter Piston. W.W. Norton & Company. 1955. ISBN 0393097404 (hardcover). The author approaches orchestration from the premise that the principles can best be presented by analysis of music as it has been written. No practical aspect of instrumentation for the orchestra is neglected, and comprehensive treatment is given to each significant component. The essentials of instrument combination discussed here are those which can be observed operating in the scores of great composers from Haydn, Mozart, and Beethoven down to our own day. Orchestration is notable for the clarity and logic of its organization. 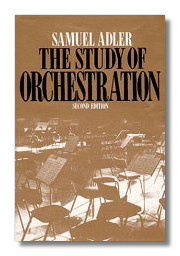 From a consideration of the individual instruments and their technical problems the author skillfully develops his analysis of orchestration, covering his analysis of orchestration, covering instrumentation of primary and secondary melodies, part-writing, chords, and contrapuntal techniques. Finally, he discusses typical problems in orchestration together with some examples of their solutions. Orchestration is profusely illustrated with hundreds of musical examples and with drawings of the various musical instruments that make up the modern orchestra. The Study of Orchestration. Samuel Adler. W.W. Norton. 1989. ISBN 0393958078 (hardcover). Five audio-cd set sold separately: 0393993906. 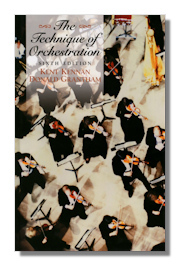 The third edition of this highly successful orchestration text follows the approach established in its innovative predecessor: Learning orchestration is best achieved through familiarity with the orchestral literature; this familiarity is most effectively accomplished from the music notation in combination with the recorded sound. The text has been revised to reflect the most informed reactions to the first and second editions, as well as Professor Adler's revisions. Elements of Orchestration. Gordon Jacob. October House. 1965. ISBN 0807900435 (hardcover). Style and Orchestration. Gardner Read. Macmillan Publishers. 1979. ISBN 0028721101 (hardcover). History of Orchestration. Adam Carse. Dover Publications. ISBN 0486212580 (paperback). Examines evolution of orchestra from Renaissance through 19th-century.